ON SALE! Two packs of Live Maine Lobsters! Home > 12 Packs Of Lobsters! > Land O' Lakes Butter > Fresh Lobsters! > Live Lobster 2 Packs! These Live Lobster "Two packs" are a great value! We Offer You A Variety Of Choices With Our Two Packs Of Fresh Live Lobsters! All orders come with a personalized hand written card with Your Message & Complete Cooking Instructions for easy preparation! Our perennial favorite, live, luscious lobsters caught by Captain Tim, The Real LobsterGuy! How about having a catch of neatly packed fresh live lobsters delivered to your doorstep tomorrow, Just for The Two of You! 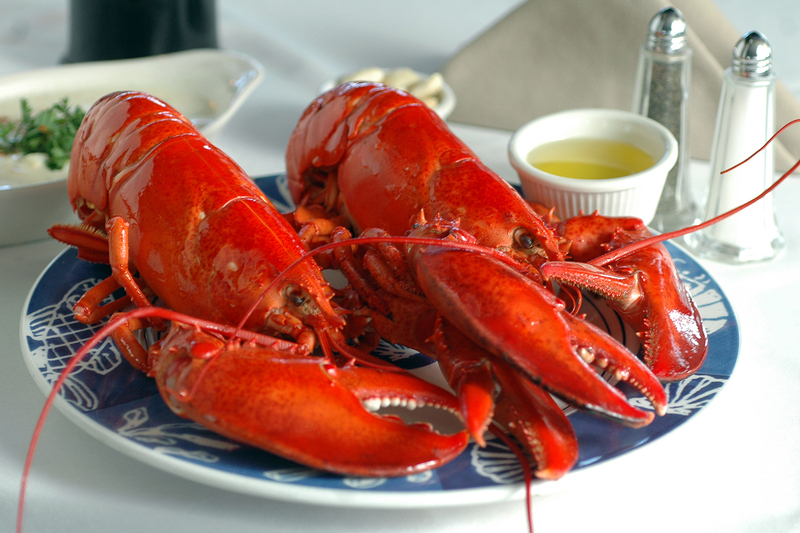 Order Live Maine Lobsters By 10am EST, And Enjoy Them For Dinner Tomorrow! Lobsters Also Make A Great Gift Idea For Your Favorite Seafood Lover! How Easy Is That! Wooo Hoo! Thanks For the Great Lobsters And Lobster Dinner We Had, it was perfect from start to finish! This is my first purchase from the Lobster Guy and I couldn't be happier! I will share this seafood site with ALL of my friends! I am truly appreciative of the freshest lobster meat I've ever tasted! YUMMY DELICIOUSNESS!!! I can't wait to order again! I've ordered these fresh lobsters 3 times now and all were delicious and the best I've had outside of Maine. And THANK YOU for offering them already steamed. So much easier to prepare--helps avoid my dilemma-- I hate killing them but love eating them. My fianc passed away six years ago and she ordered a lobster dinner that blew my mind. I still order years later. Nobody believed I could get a superb lobster overnight. Once I ordered for a friend in Texas and it got there. Great service so order a L it's worth it! This was the first time I ordered from the Lobster Guy and it will NOT BE THE LAST. COMPLETELY HAPPY. With the order and looking forward to my next Special Occasion. First time I ordered from The Lobster Guy. Service was excellent and lobster could not have been any better! Can't wait to order again! I recently gave this Live-Lobster 2 pack to my dad for his 60th birthday! My parent's used to live in Maine and now live on the West coast. The think my dad misses the most is being able to buy live lobsters. Apparently over there you can really only get the tails and usually they're frozen. I can't even begin to tell you how much he LOVED this gift. He said they tasted as fresh as if he had just gone down to the store he used to go to in Maine and picked them out. They were a big hit. I was so pleased with how these went over with him. I think I may do this every year for his birthday and maybe for other holidays as well! Thanks LobsterGuy!!! All is good with the lobster Guy!!! We order our lobsters 3-4 times a year we have also tried other companies. The Lobster Guy always delivers as promised and their product is first class . We will forever be a customer , thanks again ! We buy lobsters several times a year from supermarkets. Although they are live in a tank, they don't match the lobsters we ate last night. My son David MacCuish had them shipped to me for Mothers Day. All I can say is every bite was worth every dollar he spent. Thank you for great quality. THANK YOU SO MUCH!!!!! THE LOBSTERS WERE OUTSTANDING!!!!! AND THE PEOPLE ARE SOO NICE TO DEAL WITH!!!! WONDERFUL MEAL!!!!!! I'D GIVE YOU 100 STARS IF I COULD!!!!!! WILL BE ORDERING AGAIN!!!! Great Lobsters and very tasty clams. They arrived as promised, they were wonderfully packed and still alive. We had the lobsters the next day after refrigerating them as suggested and they were still alive and very good. My son had 4 3 lbs lobsters, clams and chowder shipped to Moses Lake, Washington. What a treat to fly in from Boston and have Maine lobster. Love love the lobster guy.from Boston ,living in Florida.had the lobster roll kit THE BEST EVER. It has been awhile and have been craving. Time to order again.thanks so much lobster guy. Thank you so much on the great product, wonderful service, and prompt delivery. Thank you so much for making this 37th wedding anniversary such a special one. The Scallops, Shrimp, and Lobsters arrive this morning. I really appreciate the attention to detail that I saw in the packaging. It was taped on the outside and had more than enough ice packs.Our thanks go to Julio, I do hope I have the name correct. As for the product received my wife and I were impressed. The Lobster had a great deal of fight in her. Again, thank you so much. Looking forward to our next order!!! I grew up in New England so I am familiar with good lobster. The lobsters I received are excellent. They were active, which indicates that they were caught recently. They had good meat to shell ratio, which is another indicator of freshness. I will make lobster newburg with the leftovers. The box arrived on time Friday mid-day by FedEx. I was indeed impressed. I had one lobster Friday night and the second Saturday for lunch. They were absolutely delicious. Next time bigger lobsters. I also had some of the little neck clams. I eat them raw and for some reason they were a little hard to open with the clam knife. They were probably very healthy with strong muscles inside. Ive eaten raw clams many times so I know how to open them. They were the best clams Ive had in years, clams had tons of flavor. I also purchased some scallops but I froze those for later. All in all a 10 out of 10. You guys really have your act together. I particularly appreciated the note personally signed by Megan, a very nice personal touch. My compliments to you and your staff.